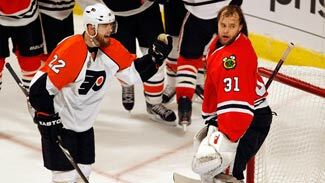 PHILADELPHIA -- One of the more compelling Cinderella stories of the 2010 Stanley Cup Playoffs has been the emergence of a pair of 26-year-olds from Finland: Chicago Blackhawks goaltender Antti Niemi and Philadelphia Flyers right wing Ville Leino. In the years prior to squaring off in the Stanley Cup Final, both players were late bloomers in Finland's SM-Liiga and saw plenty of action against each other playing for opposing teams in their homeland and last season in the American Hockey League. Leino, who played sporadically (13 games) for the Flyers in the regular season after coming over via trade from the Detroit Red Wings and did not get into the postseason lineup until the clinching fifth game of the first round against the New Jersey Devils, has racked up 3 goals and 4 assists to date in the Final. In so doing, he has run his playoff totals to 7 goals and 19 points in 18 games after posting a combined 6 goals and 11 points in 55 regular season contests with the Red Wings and Flyers. He is two points from tying Dino Ciccarelli's NHL postseason rookie record for points, established in 1981 for the Minnesota North Stars. Niemi has not played especially well in the series, apart from a stellar performance in turning back 32 of 33 shots in Chicago's 2-1 victory in Game 2. But his performance in the previous three playoff rounds against the Nashville Predators, Vancouver Canucks and San Jose Sharks were pivotal in Chicago's run to the Final. Niemi now stands one win away from becoming the first Finnish netminder in League history to backstop his team to a Stanley Cup title. The Calgary Flames' Miikka Kiprusoff came close in 2004 and Jussi Markkanen (replacing the injured Dwayne Roloson in the Final) nearly pulled it for the Edmonton Oilers two years later. Each fell one win short. Niemi will have two shots at making history. But, first, he and the team in front of him will likely to need to do a better job of containing the surprising Leino and the rest of the Flyers. Over the course of their careers in Finland and North America, Leino has often had success against Niemi. Nevertheless, he downplays the notion that he has a "book" on his countryman. "It's just one of those things," he said before Game 5. "He's a very good goaltender and maybe I've just been in a good groove when I've played against him. Does [playing against Niemi in the past] give an edge? Maybe, but he could say the same thing. It's not something I've really thought about, to be honest." But has Leino attempted to pass on his knowledge of playing against Niemi to his Philadelphia teammates? The forward simply shrugged and grinned. The emergence of Leino and Niemi started in their homeland four seasons ago. Both players were born in 1983 (Niemi on Aug. 29 and Leino on Oct. 6) and faced off numerous times at the Finnish junior level. Leino was the first to break into the SM-Liiga (the Finnish Elite League), making his debut for Ilves Tampere at age 18 during the 2002-03 season after developing in his hometown SaPKo Savolinna's system. Typical of most youngsters in the top league, he received modest ice time during his first several SM-Liiga seasons. It was not until he transferred to HPK Hämeenlinna for the 2005-06 season that Leino blossomed into a top young player in the domestic league. That year, he scored 12 goals and 43 points in 56 regular-season games. Leino began to earn a reputation as a clutch playoff performer with 3 goals and 12 points in 13 games, helping HPK win its first (and, to date, only) Finnish championship. That same season, a 22-year old Niemi cemented his graduation from the Kiekko-Vantaa junior program by signing with the Lahti Pelicans. Almost immediately, he was one of the brightest spots on an otherwise fair to middling team. The goalkeeper quickly emerged as a viable SM-Liiga starter, posting a solid 2.73 GAA and .916 save percentage. The next year, Niemi further improved on his performance under the tutelage of former NHL goaltender Pasi Nurminen. Niemi's third SM-Liiga season (2007-08) was his true breakout year. He almost singlehandedly lifted Lahti to the league's best record in the first half of the season and although the club was unable to sustain it's early pace, the goalkeeper continued to turn heads. He improved his record to 26-14-6 despite modest goal support, lowered his GAA to 2.35 and raised his save percentage to .926. He also recorded four shutouts. Niemi lost out on the Urpo Ylönen Trophy (the SM-Liiga version of the Vezina Trophy) to Kärpät Oulu's Tuomas Tarkki but had clearly emerged as a candidate for an NHL contract. The previously undrafted goaltender signed with Chicago as a free agent on May 5, 2008. Likewise, the previously undrafted Leino parlayed a breakthrough season in 2007-08 into an opportunity to play in North America. That season, as a member of Jokerit Helsinki, he won the Lasse Oksanen Trophy (the equivalent of the Hart Trophy) as league MVP after stockpiling 28 goals and 77 points in 55 games. In the playoffs, he added 8 goals and 19 points in 14 games. The Detroit Red Wings -- the NHL organization that has earned the reputation for having the keenest scouting eye on European sleeper prospects -- signed Leino after the season. Last season, both Leino and Niemi got their feet wet in the NHL, but spent most of the campaign with the AHL's Grand Rapids Griffins and Rockford IceHogs, respectively. Leino, who scored a goal in his NHL debut and later played 7 Stanley Cup Playoff games, produced 13 points in 10 AHL Calder Cup playoff games. In so doing, he provided the first hints that his reputation for coming through in the clutch in Finland may translate to the North American game. Niemi, meanwhile, made a smooth transition to playing the North American game with a strong season for Rockford (18-14-3 in 38 games) and got into three NHL games with the Hawks. Niemi clearly had a better 2009-10 regular season than Leino. The former steadily usurped veteran Cristobal Huet as the Blackhawks top goaltender, emerging as the undisputed No. 1 heading into the postseason. During the playoffs, Niemi has answered the critics who felt that his NHL inexperience would cost the Blackhawks the opportunity to play for the Cup. Leino struggled in Detroit while the club was racked with injuries and became a roster casualty once Johan Franzen was ready to return. The Red Wings' loss has been Philadelphia's gain. Soon, Leino or Niemi will become the eighth Finn in NHL history to have his name etched on the Stanley Cup.